The 2019 Photography Competition has been launched. This year Billericay's four volunteer services are again sponsoring the prizes for the Competition. A big “thank you” to Rotary Club of Billericay, Rotary Club of Billericay Mayflower, Billericay Round Table and Billericay Lions. 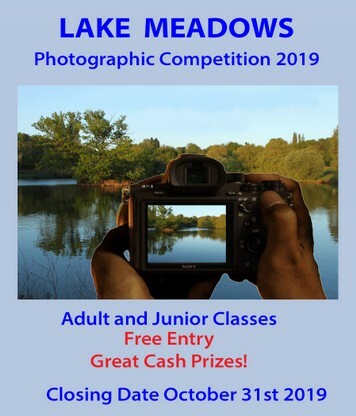 Lake Meadows has many hidden gems in addition to the more obvious delights and we hope photographers of all ages will rise to the challenge of this year's competition. Entry is free and there is a Junior class (under 16s) and Adult class (16 years old and over). Each entrant can submit up to four photographs but there is no need to wait to start submitting now. As each entry is done separately you do not have to submit all four at the same time.